The purpose of a CRM is to help you manage improve relationships with customers. In order to do that, you need data. Your forms can only gather the data that you ask for. At a very minimum, your forms collect an email address. You can ask for more fields, but each additional field lowers your response rate. The easier and simpler you make your forms, the more willing people are to fill them out. Every form also has the ability to capture information about the person filling it out behind the scenes. The browser collects some information, such as the IP address the lead is connecting from, as well as attributes about the computer being used. When this information is collected by an intelligent CRM platform, you can automatically perform a risk assessment of that lead and simultaneously augment your CRM with more information. Data appending is the process of starting with a limited amount of data about a contact — say the email address — and extrapolating more about the person. This extrapolation is done by connecting to a third-party data source and getting as much information as possible from that provider. A good CRM does this for you automatically. When you connect automatic data appending to your forms, your CRM can automatically add data that wasn’t put into the form. This data is derived from open-source places, such as an email address from a LinkedIn profile, for example. By correlating a wide range of data sources, the third-party data source can append more information to the contact record. Sometimes the data appended is online, such as someone’s Twitter handle or public LinkedIn page. Sometimes the data is correlated to other sources and can pull in offline data, such as number of children, income, and homeowner/renter status. Another useful function is a reputation assessment tool. These tools, when integrated into your forms, look up the email address and IP address and determine the reputation of the person filling out the form. This process should happen automatically with all your forms, so you can be warned if a bad actor is using your system. Large networks of users drive reputation assessment tools for your benefit. Use this data to influence how you interact with your leads. Your sales team’s time is valuable, and you want them to focus their energy on viable leads. Looking below, you see an email alert received when someone fills out a ticket. 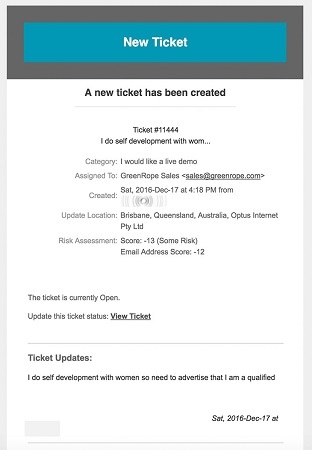 This alert informs your customer service team and management that a ticket has been created. Updates can also be sent to the same people, so everyone is aware of how the ticket is handled. A ticket email alert with useful information. The process of taking the data appending and attaching it to a contact should be an easy, if not automatic, one. Your CRM should accomplish this process for you at no cost as an added value. In the image below, you see how the information a CRM has appended to a contact’s record. Researching a contact to append social and demographic data. Most of the data fields you capture with data appending aren’t standard fields attached to the contact record. You likely have to create custom fields to store that data. 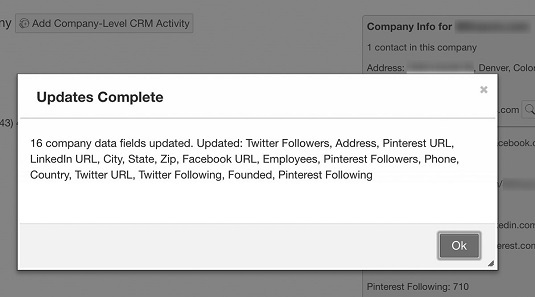 Your CRM should also give you the option to automatically create these custom fields when the data for a contact appears. You can then decide where in the View Contact screen that data is visible. Sometimes it’s difficult to find data and append it to companies. Most people fill out forms as individuals and don’t directly represent companies unless they make that clear in the form. In any case, usually company-based data appending requires the company website to confirm which company you’re appending, because websites are unique to the company. This image shows how you can use your CRM to automatically research a company and append the data found to the company’s record in your CRM. Researching a company to get more information.